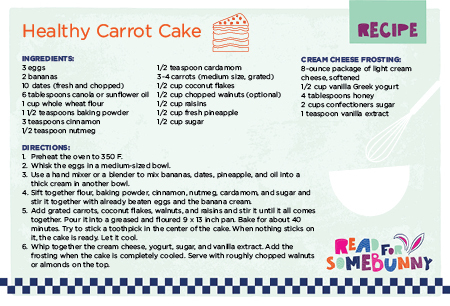 Since this year’s Read for the Record book is “Bunny Cakes” by Rosemary Wells, what better way to prepare for the record-breaking day than by cooking some tasty, healthy snacks for kids! 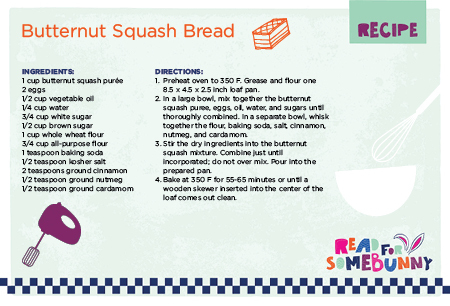 Below, we have two yummy kid friendly recipes for Butternut Squash Bread and Healthy Carrot Cake. Have fun baking these goodies with your kiddos – they will become little chefs, just like Max and Ruby from the story! Simply click on the images below to download the recipe cards, and be sure to share them with your friends! We invite you to check back on our blog for more recipes and healthy tips.